I'm telling you lately about a few products I love. 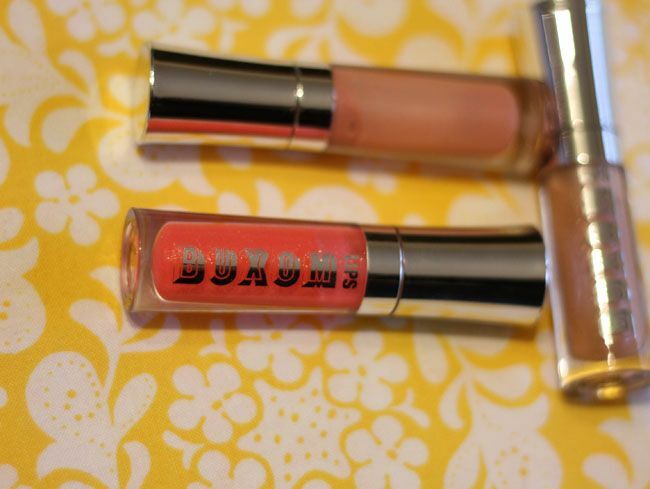 Buxom Lip gloss by Bare Escentuals, the company that makes Bare Minerals. I grabbed the first 3 out of my purse to snap a photo. But here's the truth... I probably have 8 or 9 more swimming in the bottom of my purse. It's silky not sticky. It's slightly tingly. It's minty and vanilla-y at the same time. It's sheer. It's not goopy. It layers beautifully over other colors. It's affordable. And it lasts. It's my favorite lipgloss ever. It would be a great gift to a girlfriend, gift to yourself, or stocking stuffer. *Bare Minerals didn't pay me or sponsor this post in any way. I just love their products. Do you have a favorite lip product? I reach for Burt's Bees Replenishing Lip Balm especially in winter! Great stuff. Also have a couple of the Lip shimmer too when I want a little color. Luv me the Buxom, too! I got sooooo excited when Wichita got a Sephora, a Bare Escentuals and an ULTA all in the same few months!!! I need to try that! where do you buy? Cerisse, I sometimes buy from QVC, sometimes Sephora, and sometimes a Bare Minerals boutique. I love LOVE my buxom lip gloss. It is the only lip gloss in my too many to count years of buying lip gloss where I have never lost a container of buxom and always finish it to the bitter,scraping the sides end! I had to Pin this so I wouldn't forget. Must give these a try! That stuff is the best. It's the only lip color I've been using for the past five or so years. I'm VERY fond of my CO Bigelow Ultra Mentah Lip Shine. But it's clear. I'll have to give your Buxom stuff a try!